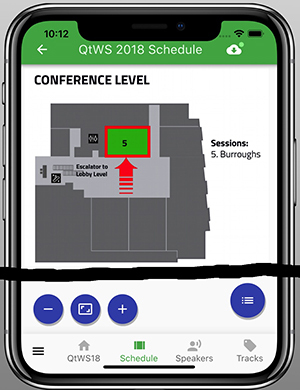 The source code can be found at GitHub.The Conference App is built using QtQuickControls 2 for Android and iOS. Two years ago I developed the QtCon 2016 and the Qt World Summit 2016 Apps. The 2018 App is an update. 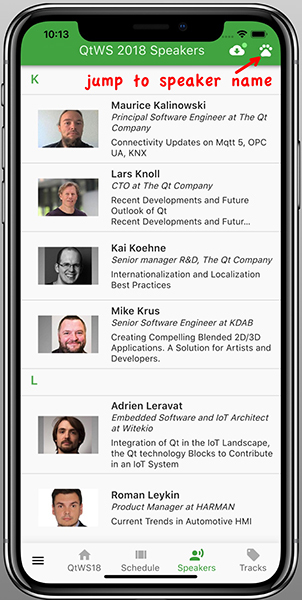 To understand some of the concepts please take a look at the Qt Blog about 2016 Conference App and my blog post about QtCon 2016 App where I explained navigation, dynamic loading, caching and data binding. 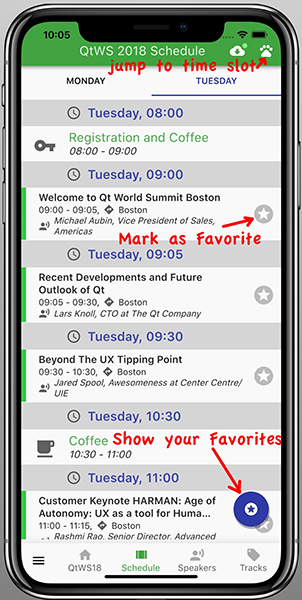 Starting the app, the first conference in Boston is selected and you can easily switch between the schedules for Boston and Berlin. Later when Boston is finished, Berlin will be selected. The schedule shows all Sessions for the selected conference and you can swipe through the days or tap on the Tab. Hint: as of today (2018-10-12) the schedule for the training day in Berlin is missing, but will follow soon. There’s an automatic version check to see if the server has new or changed data, so you’ll always get the updates. There’s also a list about all speakers. 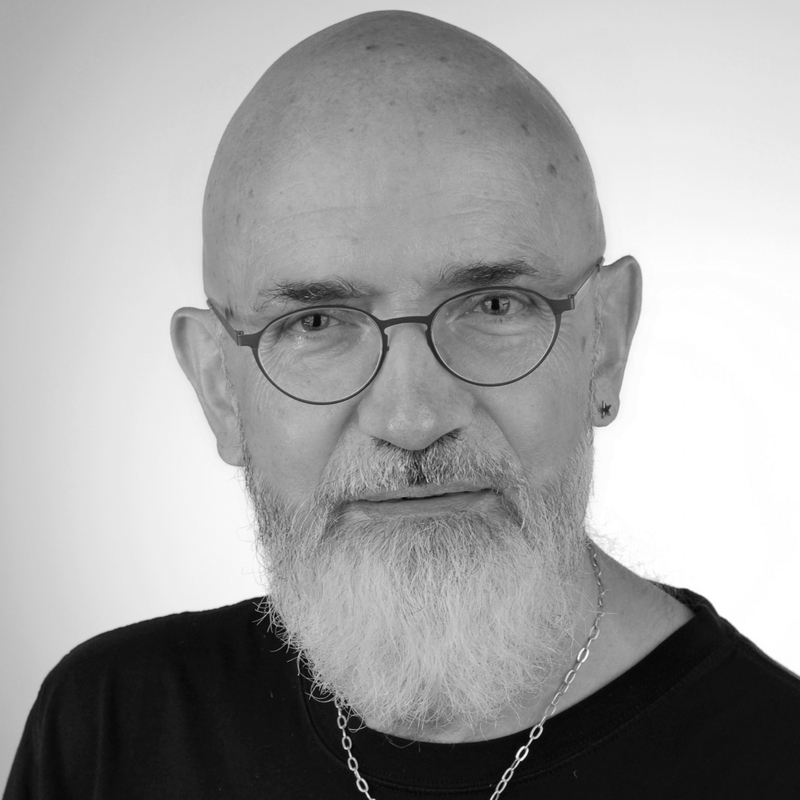 This list contains speakers from Boston and Berlin. The screenshots above are all from iPhoneX, but the conference app, of course, runs on Android and iOS. 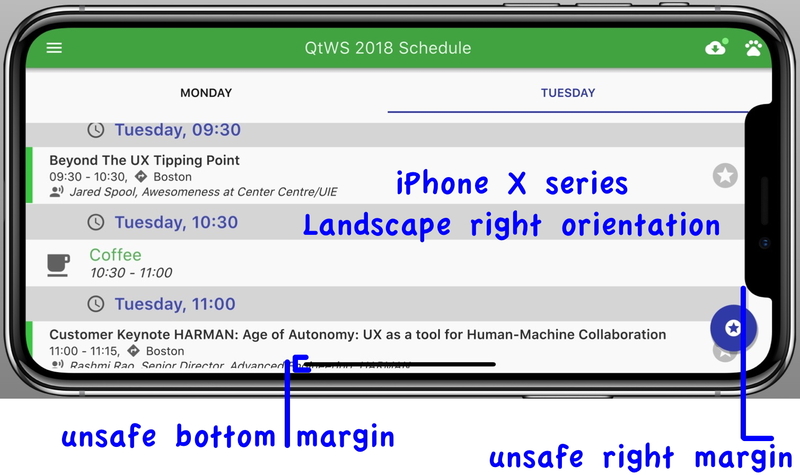 Apple requires support of iOS 12 and iPhoneX, XS, XS Max, XR with the “notch“, so it’s a good idea to prepare your app. Now your Qt App fills the total screen and you must ensure that no data is displayed in statusbar / notch or rounded corners if the device is an iPhone X. Also on „classic“ iPhones without a notch we now cover the status bar. Hint: The iPhoneX doesn’t support PortraitUpsideDown yet, but you must support this orientation because iPads need it. At first I removed it but my App was rejected by Apple. 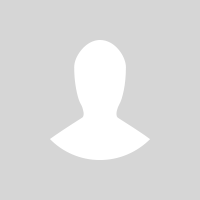 Perhaps you also need to set left and right margins because of the rounded corners. In my Apps the root Control is a StackView with header and footer. As header and footer I have placed a ToolBar with ToolButtons and they fit into the rounded corners, so I only have to set the top and bottom margins. HowTo manage the unsafe areas? 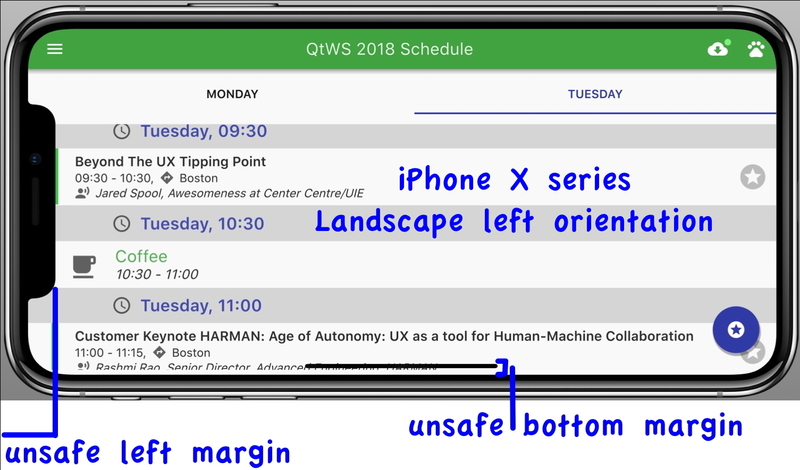 The margins depend on your App UI and iPhone Device. Starting the App the Screen.orientation changes the first time and we use this as a trigger to set Screen.orientationUpdateMask and to configure the device. Different iPhone models are detected by screen pixel size – see the details here. There are some use cases where I’m calculating sizes or positions depending on the width and height of ApplicationWindow. Now I have to subtract the top, bottom, left and right margins from unsafe areas. What about Android Devices with notch? Since Android Pie there are also some devices with a notch. I’ll add support for Android later. 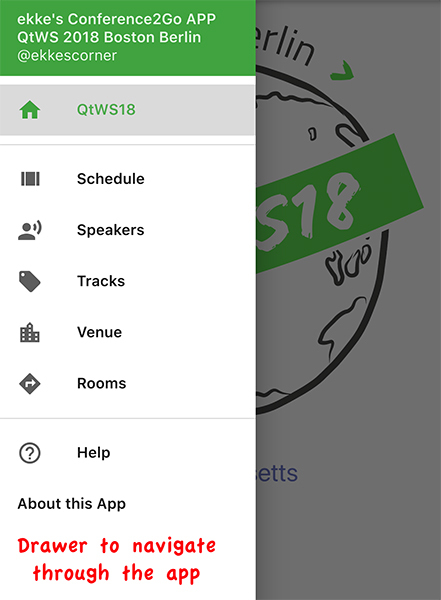 The QtWS2018 Conference App is an update of my old 2016 Conference App. In the meantime, many Controls are new or got new functionality. 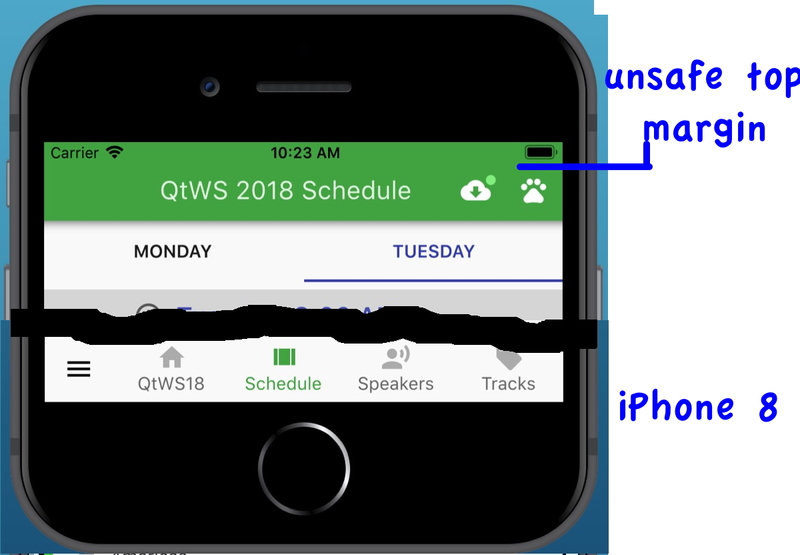 I haven’t found the time to update all of this, but hopefully before QtWS2018 Berlin starts. Remember: I’m doing all of this in my rare spare time. 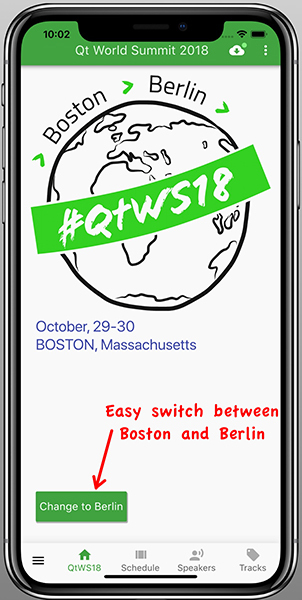 If you want to discuss the App or mobile business app development with QtQuickControls2 you can meet me in Boston or Berlin – I’ll attend both conferences. If you haven’t already done: take a look at my blog series Qt for Mobile Business Apps. Hello Ekke, good contribution as always. Have you seen the project https://github.com/jpnurmi/statusbar of JNurmi on github? Maybe you could use it to change the theme of icons in the status bar in ios and android. thanks – will try it out. probably the missing point to get the correct text and icon colors in statusbar.